Pocket, the newsreading app formerly known as Read It Later, on Wednesday took the wraps off a new update that makes it easier for users to share articles with individual friends. 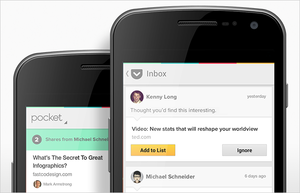 Users can send and receive stories within the app, without email. 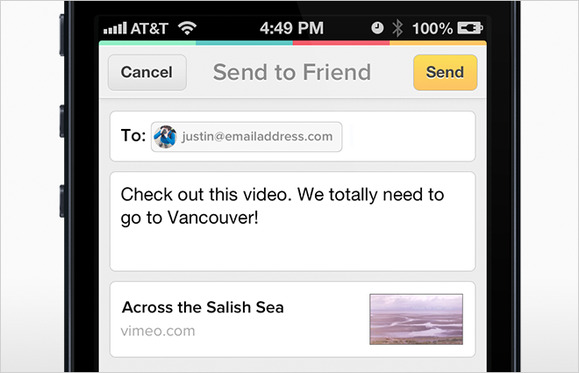 The new Send To Friend feature was introduced for all of the service’s platforms: iOS, Android, Mac, and the Chrome and Safari Web browsers. At first glance, it appears to be a slightly gussied-up version of a feature that simply lets users email a story to a friend. But the new feature appears designed to begin cultivating Pocket users as a community, the way that Instapaper, the grandaddy of newsreading apps, lets users track the stories their friends share and like. Most prominently, if you send your story to a friend who is also a Pocket reader, the article will appear in the app’s inbox, along with any highlighted quotes you choose to share—you don’t have to rely on email to use the feature, letting users linger in the app longer. Shortcut buttons allow Pocket users to send stories to specific friends. Pocket users will also be able to craft the navigation of the sharing feature, adding buttons to share stories with specific users—your wife, say, or your boss—as part of a Share Menu that also highlights the other social media services (Twitter, Facebook, and more) you’ve used to broadcast stories from the app. 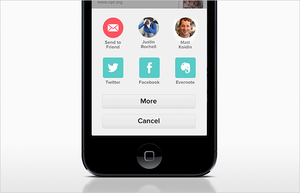 Users can also choose to receive a push notification on their phone or tablet if a story is shared with them. Pocket is free in all of its iterations. The app lets users save long stories and videos for later viewing, when a user has more free time.